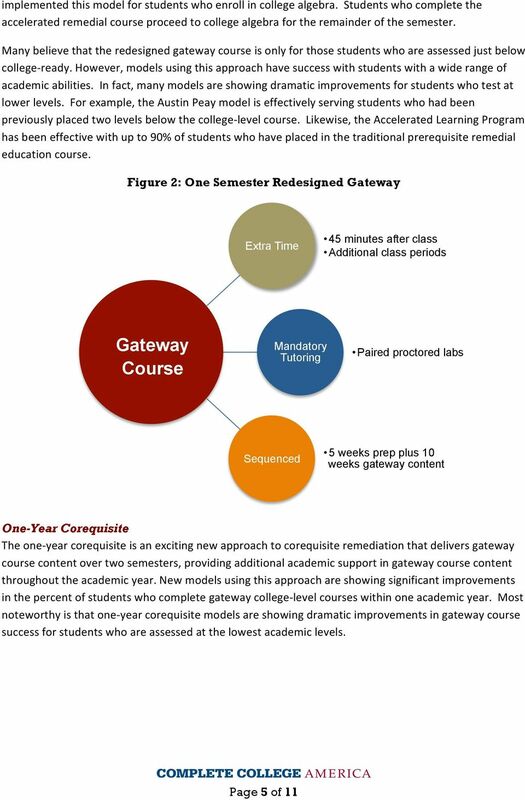 Download "PROMOTING GATEWAY COURSE SUCCESS: SCALING COREQUISITE ACADEMIC SUPPORT"
1 PROMOTING GATEWAY COURSE SUCCESS: SCALING COREQUISITE ACADEMIC SUPPORT Bruce Vandal Vice President, Complete College America Overview With research indicating that upwards of 50 percent of all new entering postsecondary education students are placed into remedial education i and that students placed into remedial education are less likely to earn a postsecondary credential ii, policymakers and postsecondary leaders alike have committed themselves to transforming remedial education in their states. 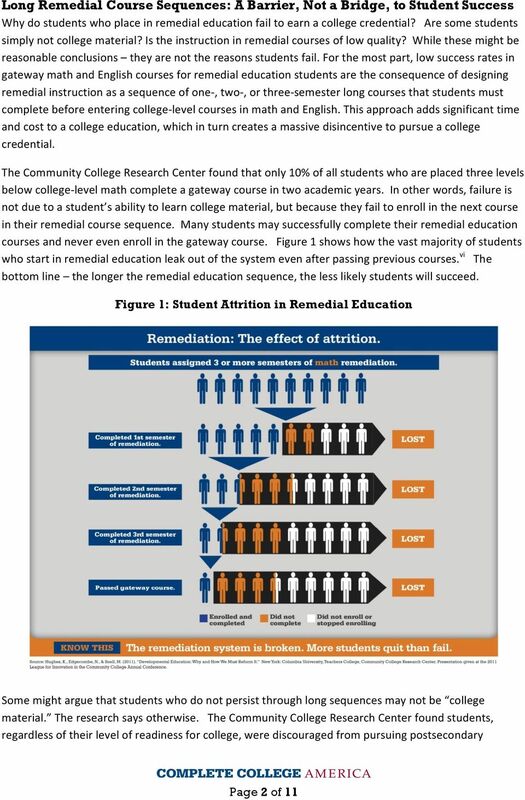 New research revealing the underlying causes of low success rates for remedial education students has led to promising new models that have resulted in dramatic increases in student success. 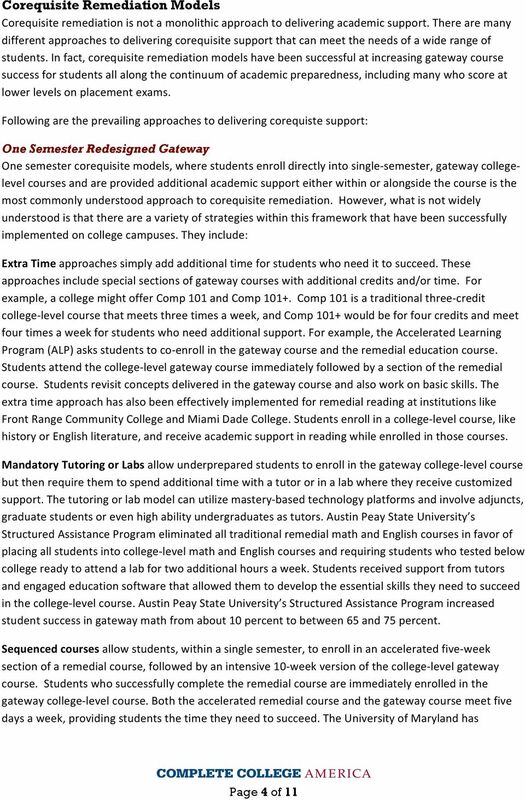 At the heart of the new research and improved practice is the realization that placing students into multi- semester, non- credit remedial course sequences as a pre- requisite to enrollment in college- level gateway courses results in most students leaking out of the system and never making it to a college gateway course. iii In addition, research has also revealed that assessment and placement practices at many colleges result in many college- ready students being placed into remedial courses. iv Consequently, innovators have found great success with models that place significantly more students directly into college- level courses and provide them additional academic support as a corequisite. 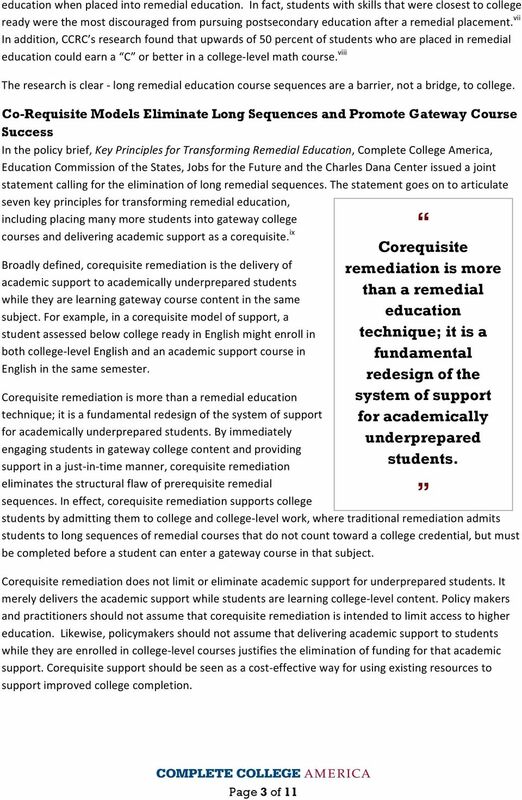 With corequisite models showing student success rates in college- level gateway courses that are two or three times better than traditional models v, postsecondary leaders and state policymakers are moving aggressively to implement corequisite remediation reform at scale. States like Connecticut, Colorado and Indiana are leading the way with legislation or state- level policies that either require or provide incentives to institutions to implement corequisite models. There is a growing sense that the adoption of corequisite models can result in significant increases in the percent of students placed into remedial education who complete gateway math and English courses in one academic year. 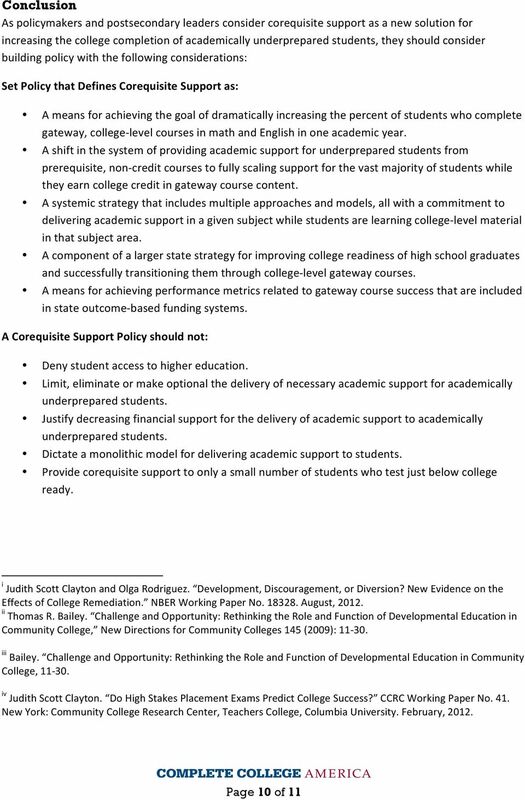 In fact, 22 states recently signed a commitment to the White House as part of its new college completion strategy to significantly increase gateway course completion in one academic year for remedial education students. 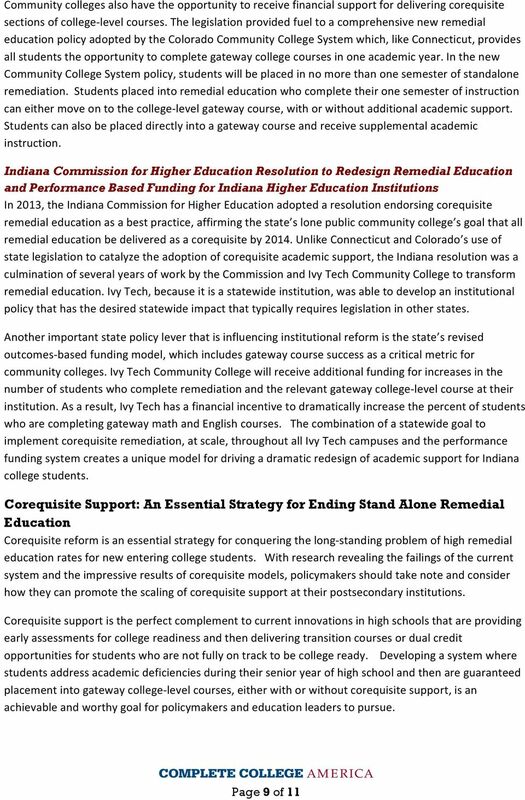 As more states consider reforms to their remedial education policies, it is important for policymakers to fully understand why prerequisite remedial education has not succeeded and how to design effective policies that lead to the broad adoption of co- requisite strategies that, in turn, result in dramatic improvements in success for students who are not optimally prepared for postsecondary education. 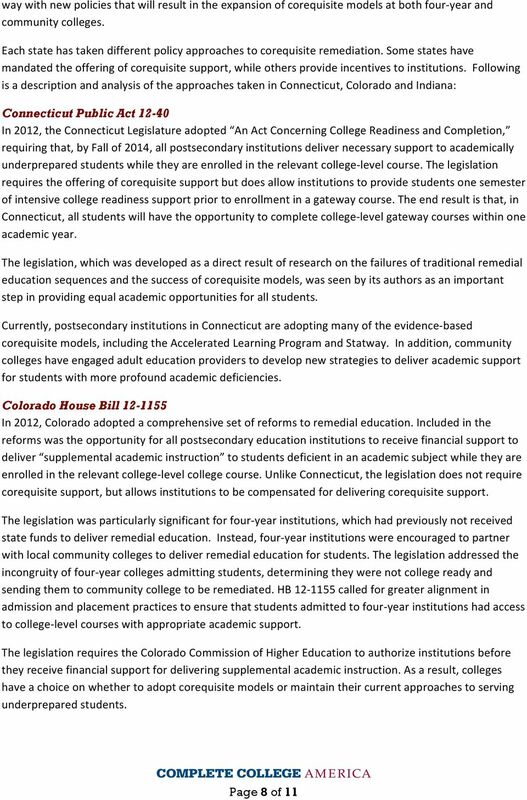 The research is clear - long remedial education course sequences are a barrier, not a bridge, to college.